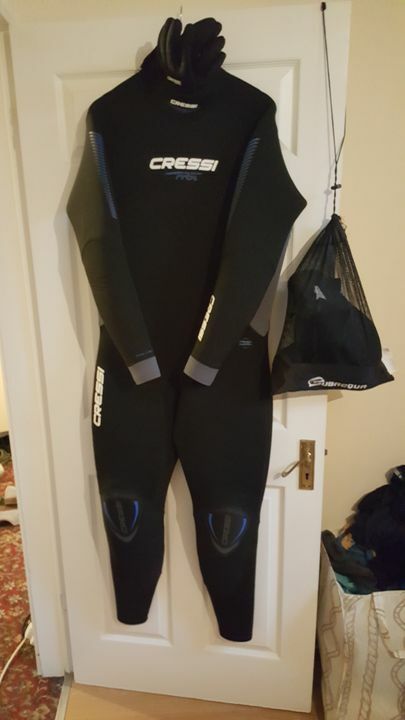 The Cressi Fast Mens 7mm Wetsuit is a thick and warm wetsuit for diving in colder waters. 7mm of neoprene is specially made to resist compression at depth so you keep the warmth even at depth. New seals around the wrists and under the zip hep slow water ingress to keep you warmer for longer by slowing water movement. Who's the 7mm Fast For? You can dive during all but the coldest months in the UK in a 7mm with the correct accessories like gloves and a hood. 7mm is one of the thickest neoprenes before it becomes too cumbersome and buoyant so they're typically used in colder waters, longer dives or by divers who feel the cold more. Boots are essential while scuba diving to keep your feet warm and to wear fins properly. When diving in colder waters a good pair of Gloves will keep your hands warm and protect them from cuts and scrapes. Thicker gloves will be warmer but you will have less dexterity so 3 or 5mm gloves are the most popular. Cressi was founded in 1946 and was one of the first manufacturers to produce diving masks with dedicated nose pockets and adjustable open heel fins. Cressi have remained an entirely family run company that produces the majority of their products in their Italian factory. Ordered 3xl size and i'm 6'4 tall.a bit small but maybe 4xl would be too large.